Fangirls, I had the amazing opportunity to send some questions to Annie Stoll and Kevin Jay Stanton of the fully funded 1001 Knights anthology. 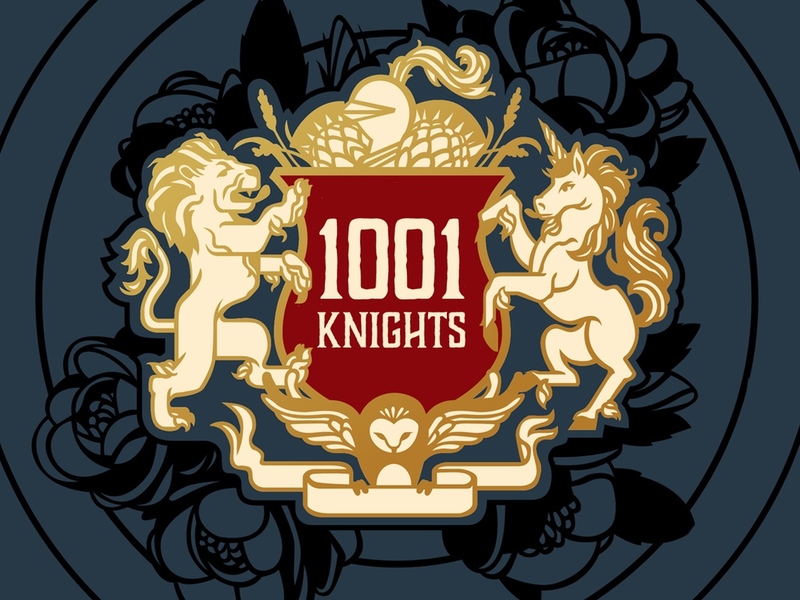 1001 Knights is a project that seems beyond amazing, and is still available to back on kickstarter, which means you can get in on the action still! The next push goal is to get more foil color to the anthology covers, and they’re only about $5,000 away from that goal. You can learn more about and pledge to the kickstarter here. But now to the great stuff. I got to send some questions over to Ms Stoll and Mr Stanton, and I got back phenomenal answers. Fangirls Are We: What type of college education did you go through? Kevin Jay Stanton: I went to Pratt Institute for a BFA in Communications Design: Illustration. FAW: Where did your interest in comics originate? AS: Before I was even into anime/manga as a little kid, I liked comic books. My dad used to read me bedtime stories, but he’d real all different kinds of books to me. I can’t really even recall my first exposure to comics, but I know it must have been through him or my mom. And as a little kid I was constantly doodling and drawing. I would make up my own terrible Sailor Moon/Spiderman crossover comics & in highschool I even had a super silly comic about my friends and I that I’d draw during math class when I was really supposed to be paying attention (do as I say not as I do– math is important! stay in school!) I also discovered webcomics- my first was “Return to Sender” by Vera Brosgol & it left a really big impression on me. Then, my college friend, Phil got me into the indie comics scene. And one day I finally got up the courage to create my own experimental comic, Ode with my partner, now husband, Tim. KJS: Until recently, I was a pretty big noob. The only comics I’d read and really enjoyed was The Sandman series by Neil Gaiman. But after my Shakespeare books came out, a friend suggested I try selling them at MoCCA in 2012. I tabled by myself and met a lot of cool people interested in my work. It wasn’t until a friend, Ian Densford, invited me to table with him at SPX that I really got a taste of what comics was like, though – there was this whole other world I’d only seen from the outside, and it felt so welcoming that I slowly waded in. Since then, I’ve spent a lot of time absorbing different kinds of comics, and am lucky to be a part of a book club that dissects them as well. I’m still very much on the outside of comics myself, but I’m working my way toward more work! FAW: Who (or what) inspires you? AS: I find inspiration in everything. From my surroundings and where I grew up, to the new places I go now that I live in NYC. I don’t like to limit myself to only enjoying one kind of art- fine art, fashion, lowbrow, street art, anime/manga, music, indie comics- I love all of it! I love to discover new artists and styles of drawing. I think it’s really important to try to find inspiration even in the smallest of things. KJS: I’m with Annie on this (and we’ve talked about it a lot, heh) – I find inspiration in a lot of things. I try to experience and travel and absorb as much as I can. FAW: What made you want to create 1001 Knights? AS: Originally Kevin reached out to me via Twitter about potentially collaborating together on a cool project. And we got to talking about what we liked (lady knights! cool art! anthologies!) and it spiraled from there. We talked on the phone a ton and hung out at shows like SPX. We talked a lot about what we can do for our fellow artists and what kinds of projects are a blast to make, but can also really give voices to those who are often spoken over. The idea of a massive anthology that is full of unexpected feminist art was something we were both instantly super passionate about! And a lot of that is also our own need to see more diverse and thoughtful characters. You can’t always wait for things to change, sometimes you have to Ghandi it and be/make the change you want to see in the world. KJS: Yeah! Specifically we’d seen this amazing animation by Olivia Huynh, of Sleeping Beauty reaching out to prick her finger but her hand instead forms an armored gauntlet and crushes the spindle. I got chills the first time I saw it. I think that Annie had retweeted it and I was like YES ALL OF THIS! FAW: How long have you been working on and planning 1001 Knights? AS: Oh gosh, about two years now? We’ve spent a lot of time planning out the project, inviting artists, talking about our message, and working on the designs! KJS: Yeah 2014 is when it first took hold, and we got serious about it fall 2014. FAW: How has 1001 Knights differed from other projects you have worked on? AS: The amount of work/preparation was astronomically more. I had worked with my year 85 Group girls on Hana Doki Kira (a shojo anthology) as well as been in several anthologies (most recently, Fight Zine! & Valor). But all those “smaller” experiences plus my dayjob as an art director really helped prepare me. It also helps when your co-creator (Kevin Jay Stanton) is one of the most amazing, kind, and talented people on the planet. The key for us was our collaboration & also realizing our limits and knowing who to call in to help where we need it. We said from the start that we listen to this project and what it needs– it takes the time it need to happen to make sure we get this right! Rushing is never a good idea. And in the end, all the effort has really paid off and we couldn’t be happier about it- this means not only will our artists get really cool books, but their art will reach new audiences now! KJS: It’s basically just bigger in every way, honestly. 1001 Knights has more than 10x the amount of artists in my last project. And whereas Fezzine had been mostly reaching out to friends, 1001 Knights was a mixture of reaching out and a call for art. The books themselves are bigger too, both in size and in quality. And the amount of time from finding artists to producing the books has been exponential. Also, this is the first time I’ve really worked with someone in this close a collaboration before. And man, I lucked out too, because Annie is driven and professional and clever and kind, and we complement each other’s strengths really well. FAW: How does it feel to have 1001 Knights funded so quickly? AS: Oh absolutely over the moon and back! Never in my wildest dreams did I think it would happen so quickly. I was certainly confident that we could achieve this goal if all of us creators and artists worked together, but I also figured that would take close to 30 days to happen. It makes me feel so hopeful and happy to see so many people support our artists and the ideals of the project– that so many people want to see an inclusive anthology that embraces diversity is wonderful. I’ve said this a bunch, but it truly speaks to not only the enormous talent of all the 250+ artists involved, but also to how much readers really want to see & will support diverse/positive content. KJS: Unbelievable! That first day in particular, where we had gotten so close, felt totally surreal. Annie and I talk so often about how much we believe in the values of 1001 Knights and how much we believe in the project, but to see the response of people believing in it too… it was overwhelming in the best way. FAW: Do you have any creating rituals? AS: Not really anything specific, though I do have several music playlists that I love to listen to depending on what I’m doing/ my mood. I even have one that I use in “desperate” times which is a Nick Drake/Wilco “Sky Blue Sky”/Joe Hisashi/Grimes mashup. Something about baroque folk really helps me focus. KJS: Green tea, ice water, pop music, noise-cancelling headphones. FAW: What was or is your favorite thing to work on or make, other than 1001 Knights? AS: Pineapple upside down cake! And sketching. I love to sketch and make messy art! I love creating watercolor paintings and hand lettered typography as well. Plus my day job is in music design- another of my passions! KJS: I tend to create a lot of personal and get a lot of satisfaction from working through them. I also am working on another big zine (not this big!) and a comic with some friends. Also now I really want to try this pineapple upside down cake! FAW: Where do you hope 1001 Knights goes? AS: My most sincere hope is that the artists involved in 1001 Knights can use this platform to expand their audiences, get new work, as well as find new artist friends. And my hope for readers is that they can pick up a copy and flip to any page and be surrounded by inspiration that carries over into their daily lives. I want people who read 1001 Knights to be challenged to see that a better world where we are positive and fight for others a world filled with diversity can be not only inspiring and creative but beautiful and inclusive. KJS: Agreed! We’ve seen this amazing community band together on twitter in particular which is so cool. We’ve heard from a few contributors that their work for the book gave them the confidence to try projects of their own, or continue their comics, or get new jobs, and that is amazing to hear. I also hope that these are picked up by cool people who can’t wait to meet and potentially hire our artists! And if this continues a conversation about diversity and strength we’ll be so happy. FAW: Do you have any future anthologies in the works? AS: We have to finish up this one first! haha! I can’t even think about the next project yet. Hana Doki Kira vol 2 will certainly happen in time. I adore working with Kevin and we’ve talked about how this is not the last time that we will collaborate together for sure! So keep an eye on us! KJS: Ack, yes! I’m working on a zine dedicated to bara and gay manga (Burl & Fur) that will launch in late February/early March. And Annie and I have already started workshopping ideas for the next collaboration (but that won’t be for some time!)! It was absolutely fantastic getting to hear from creators who are doing so much for the comics and lady-friendly communities. 1001 Knights is rad as heck, has over 250 artists, and is still accepting pledges on kickstarter. If you’ve got some extra cash, throw it their way, because these books look like they’re going to be every knight’s dream. You can follow 1001 Knights here, Annie Stoll here, Kevin Jay Stanton here, and check out the full list of artists here.